Meta tags are still important for websites no matter what others may tell you. 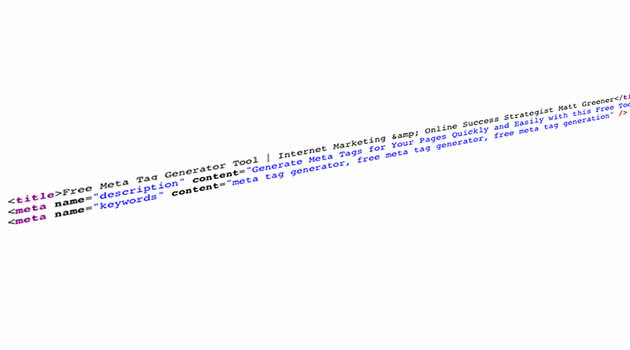 Use this tool to quickly and easily generate effective meta tags for your pages. Simply input the title and description and click on “Create META Tags”. Don’t know where to put this code? UPDATE: The Meta Keywords tag is no longer relevant or used UNLESS you stuff it with keywords, in which case it can hurt your site. (see: http://googlewebmastercentral.blogspot.com/2009/09/google-does-not-use-keywords-meta-tag.html) Best option, don’t use it. Second best option, leave it blank. Questions about Meta tags? Leave me a comment below. Hi Matt, this is a great resource, ideal for people like myself who does not really understand code and a great time saver! Excellent… I just shared this out on facebook, twitter and linked in! Hi Matt, great webinar the other night with Joel Therien. Where in my WP website do I find the tags? Once you have the All In One plugin installed and activated, you will find the All In One title, description and keyword areas below the content area when you create or edit a page or post. Thank’s Matt! I really struggle with these sometimes, I can’t wait to use this tool. It was such a joy to be in your webinar. Your coaching is so clear and easy to understand. Changed my thinking dramatically. Thank you for all that you have shared, please keep up the awesome work that you do. Thanks, Matt, This tool will save me a lot of head ache. Anxious to start using it. So good of you to share. Matt, How do I get my picture next to my comment? In order to have your picture (avatar) show up in comments, setup a free account at Gravatar. Just be sure to use the same email address when you comment and it works across the majority of blogs.